Pakistan landscape is little bit bigger than Texas, USA, but altitude starts from coastal beaches, lagoons and mangrove swamps in the south to sandy deserts, desolate plateaus, fertile plains, and dissected upland in the middle and high mountains with beautiful valleys, snow-covered peaks and eternal glaciers，top to the world's second highest peak K2, 26,000 ft (8611m). from The variety of landscape divides Pakistan into six major regions: the North High Mountainous Region, the Western Low Mountainous Region, the Balochistan Plateau, the Potohar Upland, the Punjab and the Sindh Plains.It would be not surprised by this vary geography for so many species of wild sheep exist in this country. The most trophy’s Huntin season are December to March. The Astor markhor is one of the most sought after trophies in the world, living in lower altitudes than Himalayan Ibex that also occur in this mountain range. 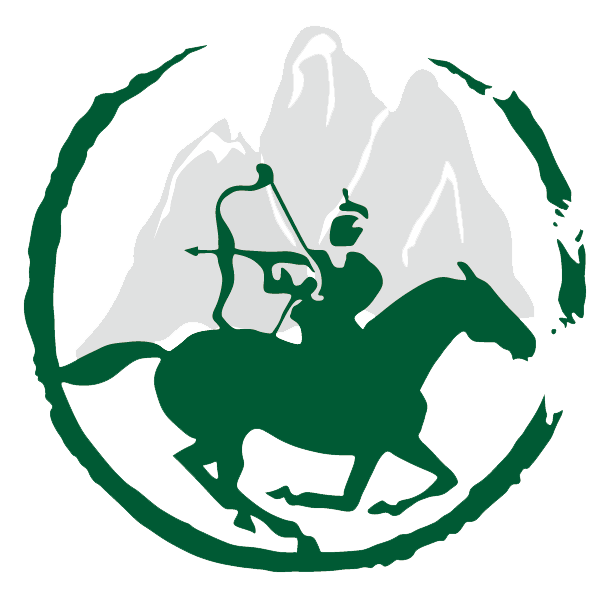 This area of Pakistan is known as Little Tibet.Astor markhor has only recently been opened for hunting and proper CITES Export Permits come with this hunt. Blue Sheep(Pseudois nayaur nayaur), which is the ancestor or king of all Blue Sheep subspecies. PAMIR Mountain is the most western point for blue sheep habitat. In this area, you will be hard to see any domestic livestock, or horses, even local living. That is lucky for wildlife, who has few clean lands for living in the current world. The Himalayan Ibex hunting area is one of the most successful community controlled conservancies.When compared to other subspecies of ibex the Himalayan Ibex appears stockier and sturdier. The Ibex hunts sometimes will not require a lot of climbing . Cost: Blue sheep US$ 27500. Blue sheep and Himalayan US$ 37400. 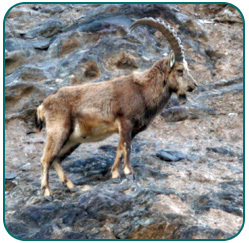 SCI Record Book recognized 5 subspeices of Markhor, based on horn shape. Bukharan Markhor(Capra flconeri heptneri), Astor Markhor (C. f. falconeri), Kashmir Markhor(C.f.cashmiriensis), Kabul Markhor(C.f.megaceros) and Sulaiman Markor(C.f.jerdoni). 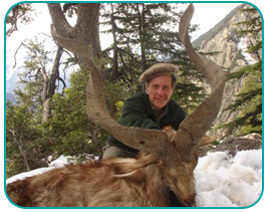 Pakistan has four of these five, beside Bukharan Markhor, also called Russian Markhor. All Markhors are listed as endangered by IUCN and Appendix I of CITES. American governement started to issue?import permit by case by case. Now it is good optunity for sheep hunter to hunt Astor, Kashmir and Sulaiman which Pakistan governemnt permit. The early writers tend to stress the Markhor’s intolerance to snow and cold and its habit of migrating in mid winter to lower altitudes. The locals are non Muslim people of the Kalash tribe, and are referred to as Kafirs, the non-believers, but which is one of the most successful community controlled wildlife management. Accommodate within a local houses or fly-camp in the valleys during hunt. Altitude: 9000 – 10,000 feet. Punjab Urial (Vignei Punjabiensis),a subspecies of Ovis Vignei is found in the Salt Range of the Punjab. Feeding and water drinking activity is confined to the early morning and evening, that is time for hunting action too. 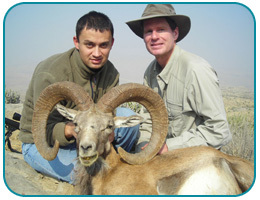 HUNT COST: Punjab urial US$ 29900. Sindh Ibex( Capra Aegagrus) mature males are spectacularly beautiful, with long sweeping scimitar shaped horns over 102cm (40”) and almost silver white bodies offset by a sooty gray chest, throat and face.The Sindh Ibex can survive almost at sea level and in fact do so in some of the remoter cliffs upto 3,350m. This guy is a real wild goat. Blanford Urial (Ovis Vignei Blanfordi) generally inhabit lower slopes but may occur as high as 9000.ft. Forturenatly the camp is not very far from Karachi City　There are 5 animal quota for this region. 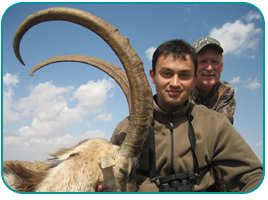 HUNT COST:　Blanford urial US$ 29500. Adventures hunters made their way to Pakistan this season despite political tensions there. Markhor was the top quarry, along with new hunts for hog deer, niglai and blackbuck. 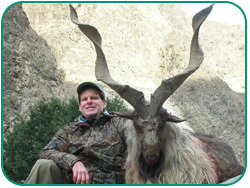 The big news is that two more Americans have taken Kashmir markhor. These hunts take place the first few months of the year when snows pushes the markhor down to elevations of about 6,000 feet. The best time is in March during the rut and when snow at the lower elevations has melted, allowing green-up to start. Hunts run about three days depending on the area. Trophy quality runs from about 40 to 48 inches. Some other opportunities in Pakistan that a few farm has opened to foreign hunters for the first time are some hunts for free-ranging hog deer, nilgai and blackbuck in the Punjab.Likely to add some driven partridge shoots. Rates should run about $6,500 for hog deer, and $6,000 for both nilgai and blackbuck. Hunts are all for three days. Hunters arrive in Islamabad where they are met and escorted at all times. All of their travel is low profile, and clients stay at private estates with armed guards. When asked about the current security situation, he said all was quiet, but that right now Pakistan is only for the adventurous hunter with a high risk tolerance and who understands that acts of terror are unpredictable.